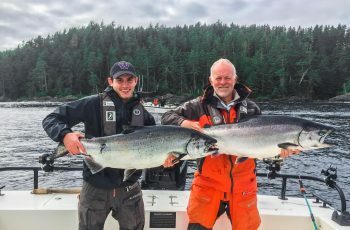 I thought I would give you a quick update on today’s fishing here at Langara. The winds died down somewhat, the sun showed itself, a very pleasant day for sure. 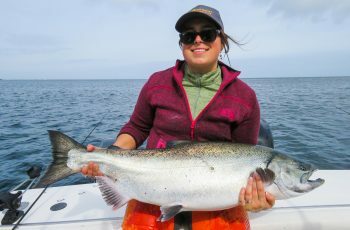 The waters calmed down out west making it possible to fish Lacy, so all in all lots of fun and action out there. The top fish today was a 28 lb Chinook, landed on Jordie’s craft, a fish taken out in the swells at Lacy. 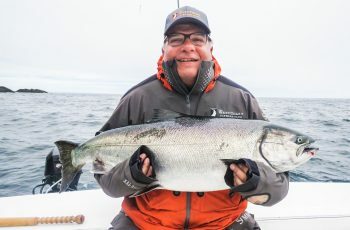 A large bait ball was in Mutton Bay, suspended at a depth of 100 feet, and there were plenty of Chinook feeding there. 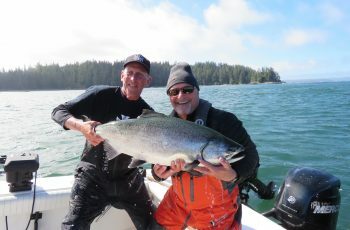 Some of the guides such as Jordie found fish shallow, I fished 60 feet and 90 and was picking off 16 to 20 lbers steady. Bud had a 24 on his sled, Kory had a 21, we had up to 20, so you can see the fish were of medium size. 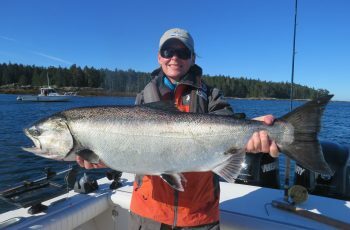 Plenty coho causing guides to plenty of turmoil, Kui slapped on spoons, others plugs. 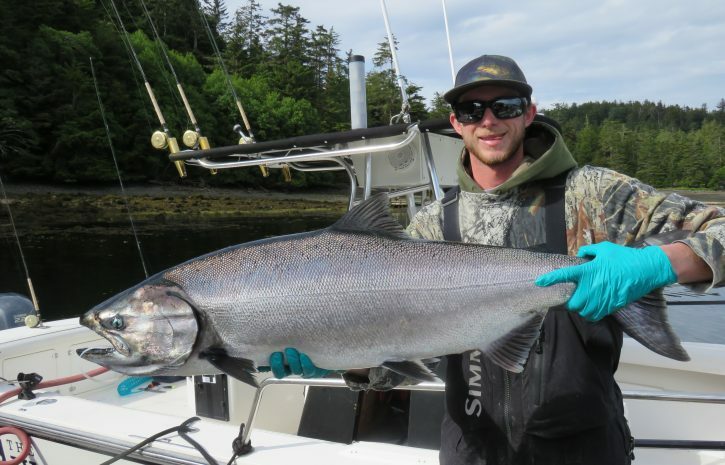 Those coho were top to bottom, and when they find you the brailer is filled fast. I went through a bunch of ice today, keeping them chilled and prime for the table. Average size was 9 lbs, and you can walk on they’re backs. I left after a couple hours for Coho Point, and soon found it was loaded with Coho, what a surprise. I dragged deep in the mud, finding lots of Chinook in the teens, avoiding those coho to a degree. No sea lions today, must be a day off, or sick of eating my springs for lunch and dinner. Yesterday was a tragic one out at Lacy, all good fish we hooked were destroyed in short order. There are now lions on the pullouts wearing a variety of gear proudly, from orange weights, flashers, teasers, a couple spoons….hope they enjoy it! Tell Bryce Hatter say HI !!! Well done Pal . OMG a 63 lber is unbelievable but to guide the old man into it is unreal. You be the man!! Have a good summer and see you soon. Ukee soon for me.